Private First Class Ward was a member of Headquarters and Service Company, 2nd Battalion, 7th Marines, 1st Marine Division. He was Killed in Action while fighting the enemy in Korea on November 6, 1950. His remains were not recovered. Private First Class Ward was awarded the Purple Heart, the Combat Action Ribbon, the Korean Service Medal, the United Nations Service Medal, the National Defense Service Medal, the Korean Presidential Unit Citation and the Republic of Korea War Service Medal. The remains of a U.S. Marine from Utica have been identified more than 50 years after he died while fighting in the Korean War, a published report said Tuesday. Private First Class John Ward was killed during the retreat from the Chosin Reservoir in North Korea in 1950. The North Koreans didn't hand over his remains until four years later. Ward's unidentified remains were laid to rest in a grave in Hawaii's National Memorial Cemetery of the Pacific. Military officials said Ward's identification was delayed for decades because of errors with his dental records, according to the Observer-Dispatch of Utica. Forensics experts then revisited the case and identified him using corrected dental records and a fingerprint from his files. Ward's sister, Elenita Ashley of Titusville, Pennsylvania, recalled the day her family was told her brother was missing in action. "It was a Sunday and it sticks in my mind. It was the first time I saw my father cry," Ashley told the newspaper. Upon hearing that her brother's remains were identified, Ashley said she was in "utter disbelief." Ward would be 76 now, according to relatives. His family plans to have him reburied at Arlington National Cemetery. About 100 friends, relatives, community members, veterans and city officials attended a memorial service Saturday morning for Private First Class John Lawrence Ward at the Korean War Monument on Memorial Parkway. Ward was killed during the Battle of Chosin Reservoir in North Korea on Nov. 6, 1950, but his remains were not identified until the fall of 2005. He was buried in April in Arlington National Cemetery. A wreath was placed in front of the monument Saturday as Joe Fraccola, commander of Central New York Chapter 490 of the Military Order of the Purple Heart, spoke about the importance of honoring Ward's memory. "We never forget out vets, and that's what this is all about," Fracola said after the ceremony. "He was in an unknown grave for 50 years, and it's about time we honor this local hero." Following the ceremony, Utica Mayor Timothy Julian declared Saturday "Private First Class John Lawrence Ward Day" in the city to honor the Marine, a Utica native. Erica Tollerton remembers when Private First Class John Lawrence Ward was in her wedding in 1949. "Johnny was an usher," Tollerton said. "He and my husband were buddies ever since grade school." Tollerton was one of about 100 friends, relatives, community members, veterans and city officials who attended a memorial service Saturday morning for Ward at the Korean War Monument on the Memorial Parkway. Ward was killed during the Battle of Chosin Reservoir in North Korea Nov. 6, 1950, just one year after Tollerton's wedding. His remains were not identified until the fall of 2005, and he was buried in April in Arlington National Cemetery. A wreath was placed in front of the monument Saturday as Joe Fraccola, commander of Central New York Chapter 490 of the Military Order of the Purple Heart, spoke about the importance of honoring Ward's memory. That was followed by a gun salute and the playing of "Taps." Attendants walked around, talking to one another, sharing the ways they knew Ward. One was a friend of his sister, another a classmate. Ward's aunt and other family members shared memories about him prior to the ceremony. "I used to take care of him when he was a small child. I would get him dressed and take him out for a walk," said Elizabeth Kloster, Ward's aunt. "I think it's wonderful we're having this, and I think he deserves it." Tollerton was thankful Ward's remains had finally been returned. "This is a very good thing to do," she said. "He was finally identified, and everyone can rest knowing now that he is right where he should be." for Private Dirst Class John Lawrence Ward, a Marine from Utica whose remains were not identified for more than 50 years. 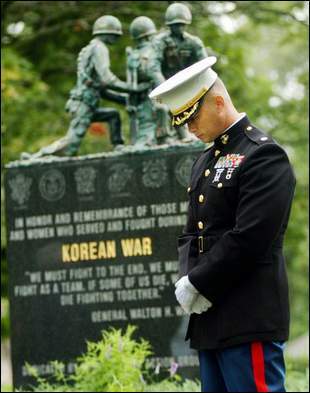 He was honored at the Korean War Monument on the Memorial Parkway in Utica.